This was one recipe that, when I started, I must admit I was a little bit intimidated by. Which is just silly because it couldn't be easier. 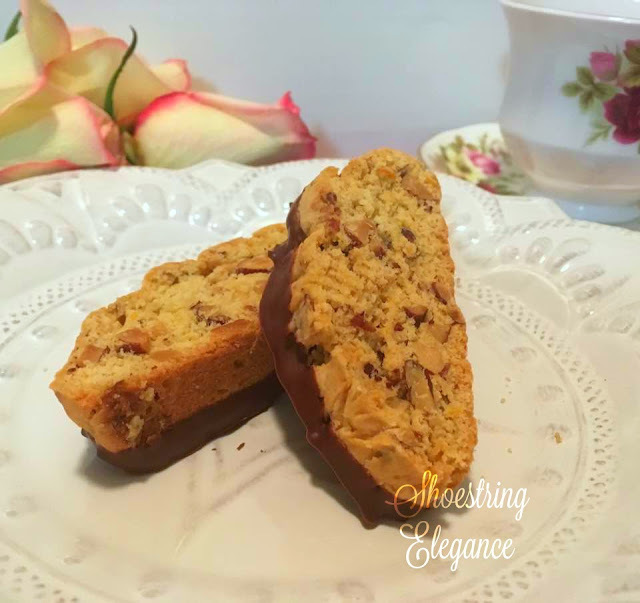 I saw the bakers on that British baking contest show being given Biscotti as a baking challenge and thought, I can do that! You know what I was right! They used all kinds of different combinations of ingredients and you can personalize this recipe to your own tastes too. 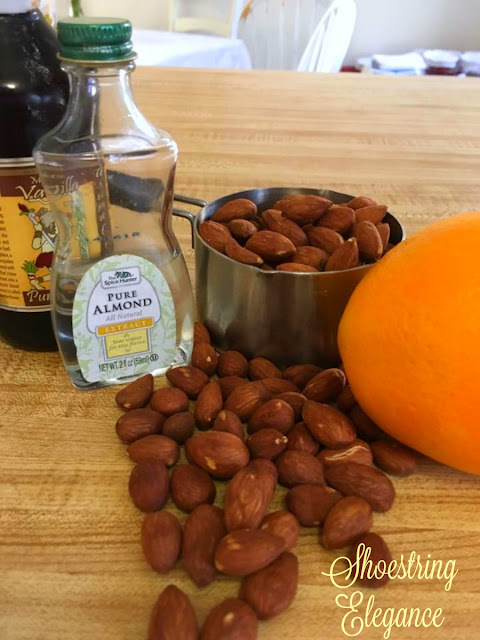 I love the combination of almonds and orange together. I just think they are a marriage made in heaven, but if you like something else please adapt this to your liking. However, if you are going to use almonds, may I make a suggestion, that I think makes a gigantic difference?! Don't buy roasted almonds. Just don't. It is SO easy to roast your own and then you are sure to get the flavor and freshness you like. Tell a friend your roasting your own almonds! They will think you are a gourmet! It amazes me how many people are surprised by this very easy step. Buy Raw Almonds at your local Sprouts or whole foods supplier, for this recipe you need at least a cup and a half, maybe a little more. I wait until they go on sale and stock up. They keep well and I roast what I need right before using them in my baking. To roast your almonds, spread them out on a baking/cookie sheet in a single layer, place in a preheated oven at 325*F until you start to smell them. It's heavenly! About 20-25 minutes, depending on how you like them. They will continue to cook a little after you have removed them from the oven so keep that in mind when you are checking them. That's it! No Salt. No oil! Nothing. 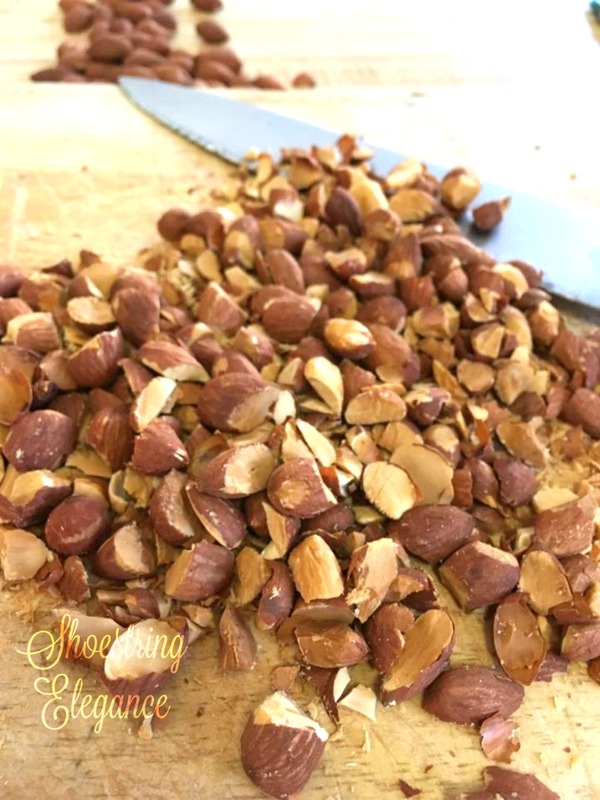 You are using them for baking, so you want them to be simply pure wonderful roasted almond goodness! (You may want to make a handful or two more than you need for your recipe because if you're anything like me you'll need to 'taste test' several before they fully cool.. Insert smiley here. :) ) Assemble your ingredients. 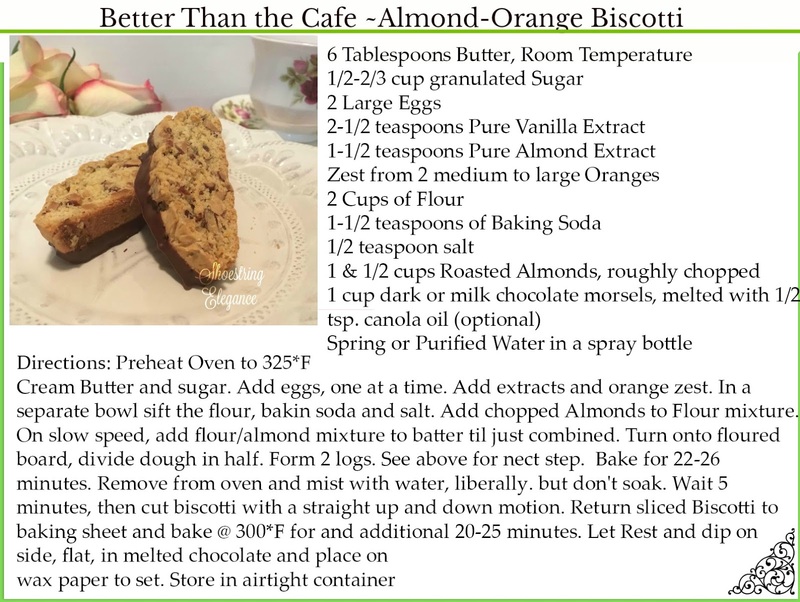 See the recipe card at bottom of the page. I always think it's a little daunting when starting a new type of baking and your not sure what it is supposed to look like. Therefore, I like to add as many images as I can for you to see, so you know you are on the right path. 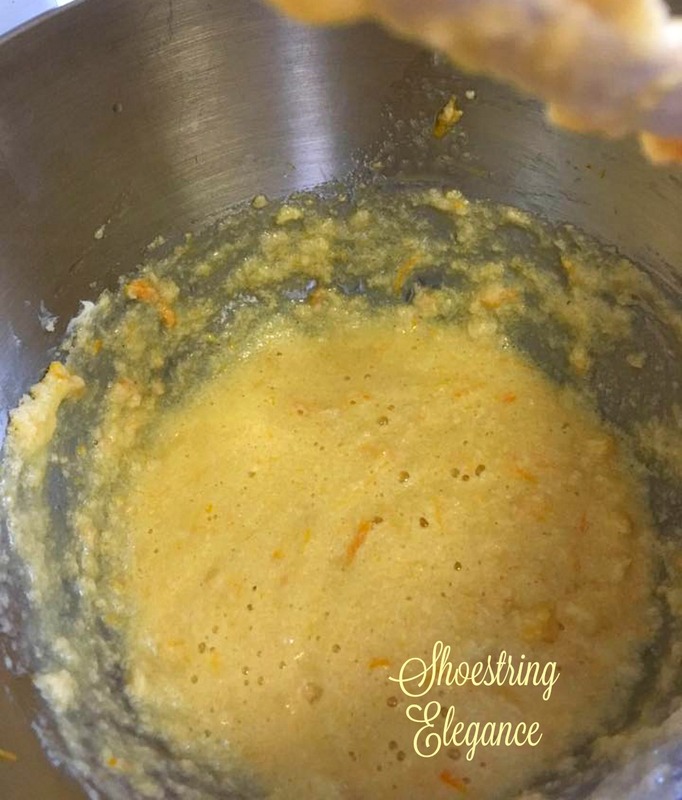 This is what your batter looks like after you have creamed your butter and sugar, added your eggs, zest and flavorings. Yes, it has a bit of a curdled look, but that's okay. That is how it is supposed to look. 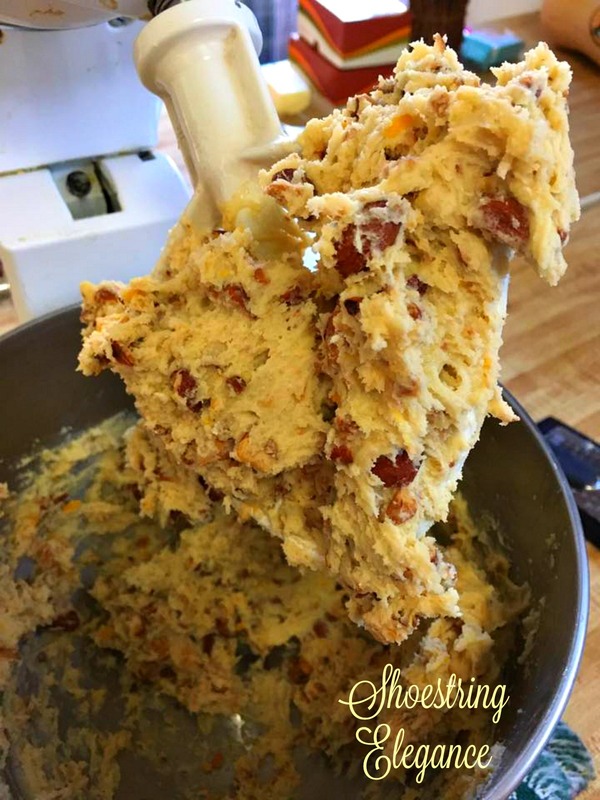 After adding your flour mixture with chopped almonds, your finished cookie dough should look something like this. May I just tell you I think I would make this even if nobody liked them but me? I'm serious, the combination of the fresh orange zest with the almond and vanilla extracts produces an aroma that is just short of Heaven. Biscotti actually means twice cooked (or baked) in Latin. 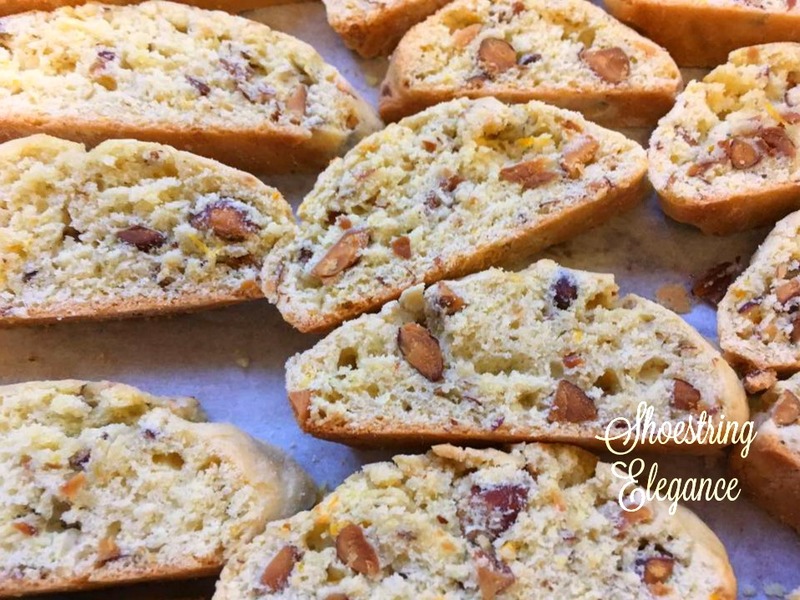 In fact, The word biscotti, in this sense, shares its origin with the British English word "biscuit", which describes what American English-speakers refer to as a "cookie". 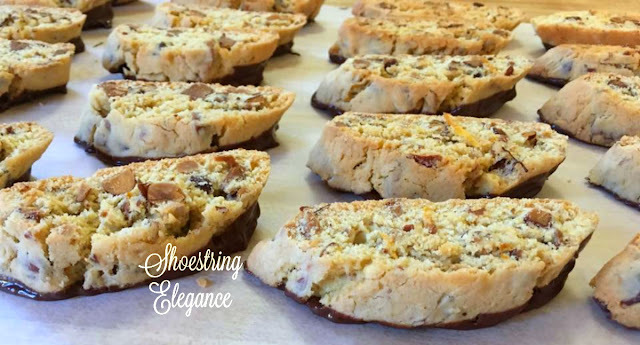 In modern Italian, the word biscotti refers to any cookie or cracker, just as does the British use of the word "biscuit". The number of bakings or hardness is not relevant to the term. In America, the term "biscotti" refers only to this specific Italian cookie. I know. I'm a bit of a food nerd, but I love to learn! 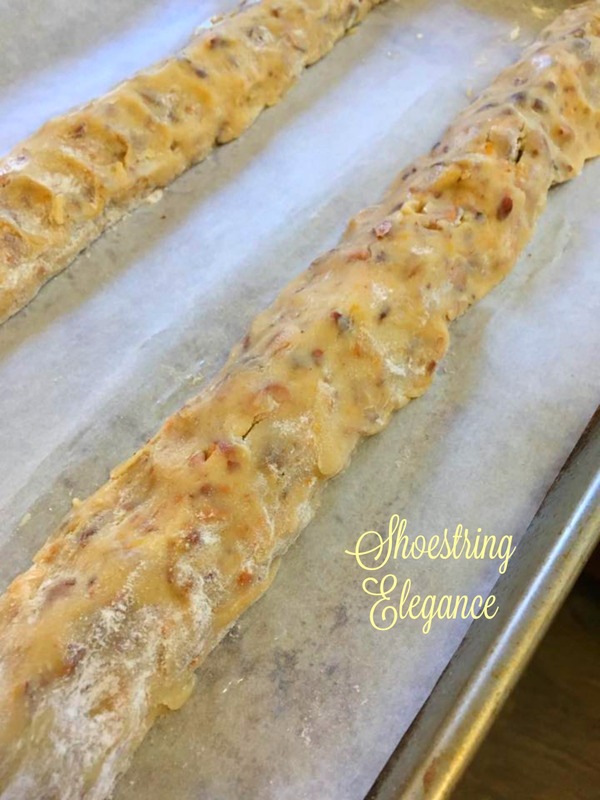 (Your Biscotti, after their first bake should look like this. Immediately mist them with your spring or purified water and let sit for five minutes before cutting) Using this trick will help prevent your cookies from crumbling under your knife. Please don't be deterred if you get some crumbs or a few of your Biscotti crumble, most will turn out just perfectly and the odds and ends are for the chef! Lucky us! Return your cut cookies to the oven for their second bake, with your heat now decreased from 350*F to 300*F. This step takes about another 20-25 minutes. When you are done with your 2nd bake, they will look something like this. :) Yay! 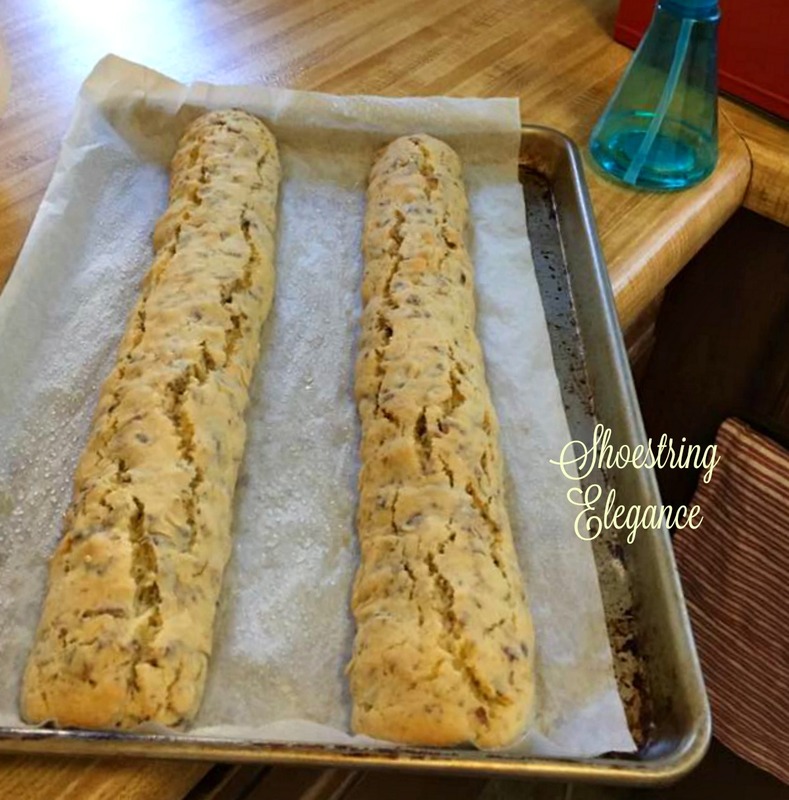 You have just made Biscotti! Not to mention roasted your own almonds. For the finishing touch (not all people like chocolate and this step can be omitted) I personally love it! 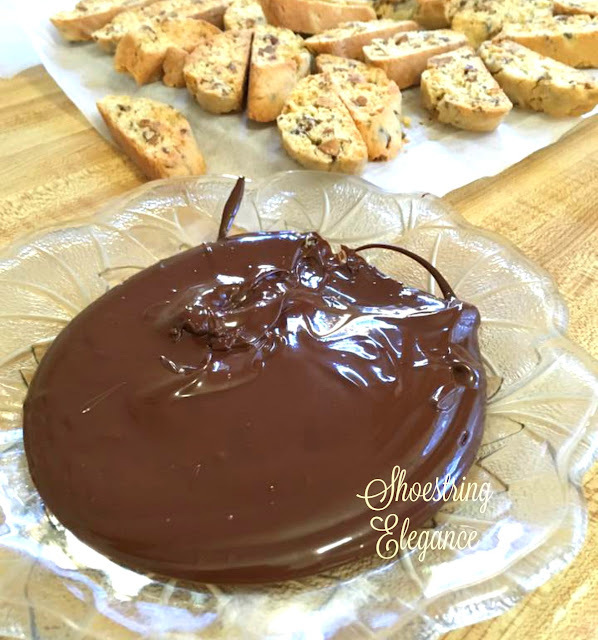 Melt a cup of your favorite chocolate, I add a teaspoon of canola oil for that nice shiny look, but it's not necessary, pour it onto to a flat plate, this makes your dipping much easier and keeps you significantly cleaner. Dip one side of your cookie and place chocolate side down onto wax paper. Allow the chocolate to set and place them in an airtight container to store if you're lucky enough to keep them around for awhile. I hope you enjoy these as much as we do. Thank you so much for joining me. Thank you to all of you who have reached out to inquire about my safety and added your prayers on my behalf. 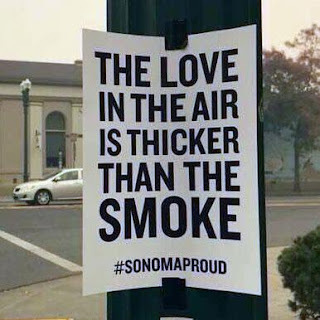 If you are reading this and you have ever been devastated by wildfires, please know that my prayers are with you. 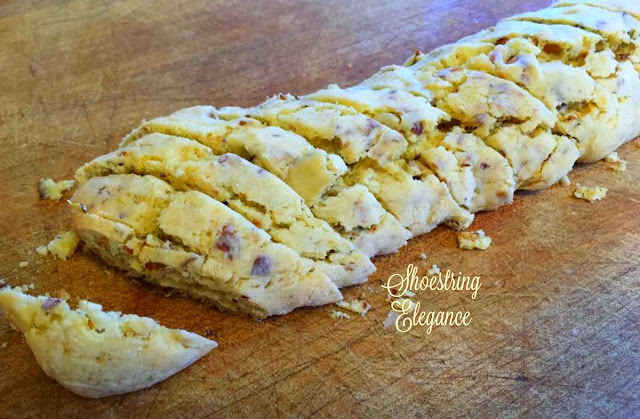 This blog has a printer friendly button, so feel free to use it and just print the section of the post with the recipe card. Cut it out and add it to your own. Nobody will ever know. This post was Graciously FEATURED by these beautiful Bloggers! I'm so glad you're safe, Theresa. I can only imagine the horror that so many are going through. My sister in law sent a photo of one of those signs to us. 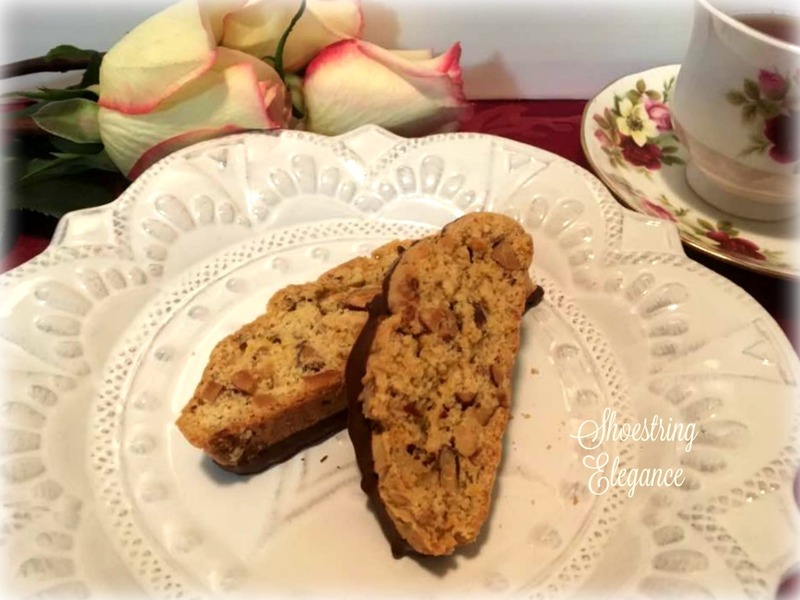 I love the history of the biscotti! Your recipe sounds and looks amazing! I've never made it, but I'm going to put this on my holiday baking list this year. Pinning to remember! I hope you'll stop by Snickerdoodle on Saturday and share with our party! Thank you so much, Beverly. Yes, the devastation is so widespread its heart wrenching. I'm so glad you like my Biscotti. I'm sure you will be happy if you do make them this year. They truly are delicious. Popping over to share at your wonderful party! You're welcome, Theresa. I'm popping back by to let you know that I'll be featuring your biscotti at today's Snickerdoodle Party. Thanks for joining us! I am so glad that you and your family are safe. I love biscotti. I have not made them but I just might try these. Great post and tutorial on baking them. I hope you will share these at Wonderful Wednesday Blog Hop that goes live tonight at 7 pm. Thank you so much, Carrie! Popping over to share at your new party! Thanks for the comment and invite! I am glad you are safe Theresa. The fires have been unbelievable. Comfort food looks like a great idea. Your biscotti looks delicious. Thanks for sharing at Home Sweet Home. You make it look so simple (and they look yummy!) Thanks for sharing at the What's for Dinner party!